The ASSA 90002 is an extremely secure tumbler lock with handle. It is ideal for cellars, back doors, storage buildings and garage doors. The ASSA 90002 also has a special secure mode in which the thumbturn can be disconnected. The lock has nine brass tumblers and can be set to lock automatically if you turn the key 360°. The bolt is 21 mm long in locked position. To inhibit sawing and breaking, the bolt is hardened and mechanically guided. The ASSA 90002 has a secure mode in which the thumbturn can be disconnected so that the key must be used from the inside as well. All components in the package meet the requirements of Swedish Standard SS 3522, class 3. If the door is in poor condition, or if your insurance company has specific demands for approved lock units, you can supplement the door with our door reinforcement fitting, the ASSA 4292, and covering plate 4291. Remember that your burglary protection is never stronger than its weakest link - you need to have equally strong protection on all exterior doors as on the main door. Remember too that it must be easy to evacuate in the event of emergencies. There is no time to search for keys in a panic situation. 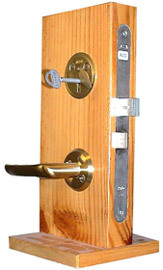 Doors that you use often should be fitted with an ASSA 2000 Evo instead, which has a thumbturn.